I imagine the fact we all appear to have affection for “Giants” must go back to our childhood love of nursery rhymes or “Fairy tales”. Somehow a friendly giant offers us security and safety from evil. In fact the only giant I recall being frightened of was the one eyed Cyclops in the Tales of Sinbad the Sailor. Wrestling has always included more than its share of giants for entertainment value. These larger than life villains or heroes help with the story lines and give the spectators something more interesting to watch than two run of the mill average size grapplers. Over the decades I have been fortunate to have seen in real life some of the legendary figures of our sport who could be classed as giant, men such as The Angel,(Maurice Tillet) or ex boxer and strongman Primo Carnera. One of the biggest men in wrestling was sumo wrestler Konisti who weighed in at 589lbs or 267kgs. An example of an Irish giant was Jim Cully both a boxer and a wrestler, not only heavy, but had a height of 7ft 4 inches. Being tall and heavy however does not mean automatically one is going to be a good boxer or wrestler. Former worlds strongest man the late Paul Anderson, although he could out-lift most men by a mile was fairly useless as a wrestler, and the old adage “The bigger they are the harder they fall” is still true today in a world of superlatives and ever-growing fighting men. 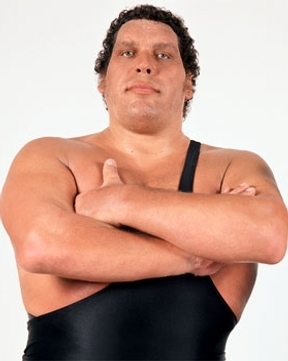 In contrast however, Andre the Giant who by co incidence was of similar height to the fore mentioned Jim Cully, but weighed more at up to 500lbs,was actually quite a good wrestler and his later lack of skill was intentional to emphasise his size rather than his skill. The towering titan of the mat game first showed up circa 1971 in Canada under the Jean Ferre circuit. By his 20s he had wrestled most places around the world, including the UK, Middle East, South Africa etc. Statistics vary as always, but he is usually described as “over 7ft 4ins” with a “normal” bodyweight of 500lbs. That is a lot of weight for any man to attempt to throw around, yet later we will see that Hulk Hogan famously managed to body slam Andre to the canvas. Andre’s potential was soon recognised by the infamous Vince Mc Mahon senior taking control of the giant, giving him a new persona, schedule and far higher earnings. Soon Andre became as well known by the public as Mohammed Ali, later appearing on the same program of wrestlers via boxers, a favourite argument of the layman, taking on the Japanese wrestler Inoki, who put up what’s become one of the most embarrassing “bouts” of all time. (Most of the time Inoki lay on the floor kicking a bemused Ali, who like the audience soon had enough, the bout contentiously ending in a “draw”.) Andre fought a far better fight with the huge boxer Chuck Wepner and flung the boxer high out of the ring in the third round, this time a victory for the wrestlers. On the subject of wrestlers versus boxers, my favourite all time great British wrestler Bert Assirati had a standing side bet of a £100 open to any boxer, to my knowledge, it was always safe. Bert also travelled to the USA, had 65 bouts, Bert won 63 and later the other two on rematches. A record he can be truly to be proud of. 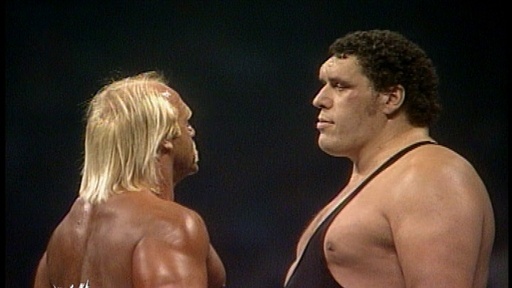 Andre remained almost invincible until the popular Hulk Hogan pinned him in front of 92,000 people at a Wrestling Mania Show where he slammed Andre, all 500lbs of him to the mat, as mentioned above. This wasn’t the end of the feud however as Andre took his revenge, beating The Hulk on February 1988 in Indianapolis for the World Title. Despite his huge size, Andre was actually rather a skilled wrestler, unlike the later children’s favourite UK British “star” of TV wrestling “Big Daddy” aka Shirley Crabtree. When required Andre could do a good drop kick and had a wide repertoire of locks, throws and holds. 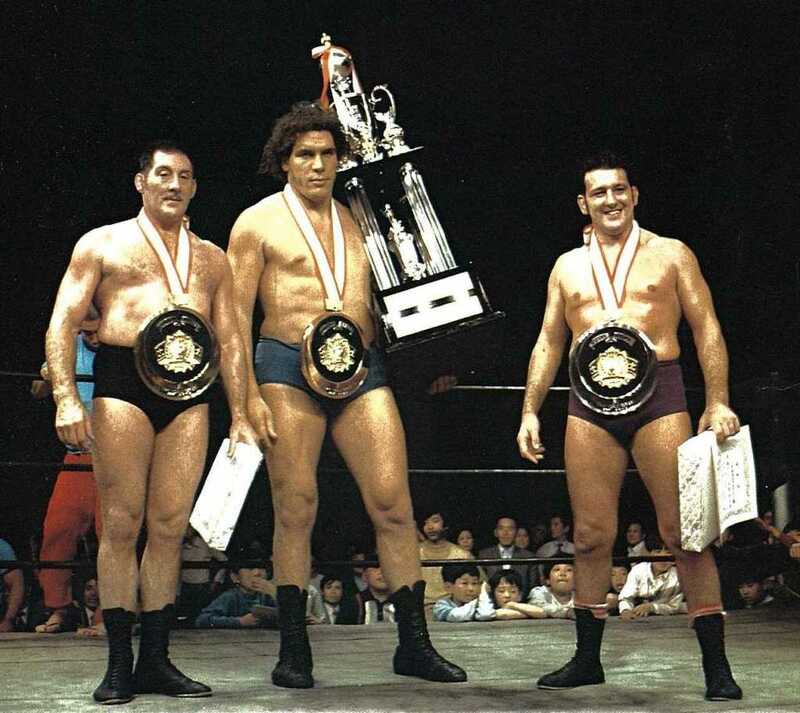 When age 17 years he moved to Paris, then in 1970 Made his Japanese debut winning single and tag team titles under the name of Monster Roussimoff. From this period he literally fought his way through the multi various wrestling associations and various acronyms and combinations of WW plus. Andre played the game and stuck to the rules switching his ring persona from good guy to villain as required with complicated story lines of various feuds. At one period Andre was the highest paid wrestler in history earning an estimated $400,000 in one year alone circa 1970s. In 1987 Andre drew the biggest crowd to date for the WWF in history, estimated at 90,000 plus fans in Detroit Michigan. Always busy, he was later to wrestle in six “Wrestle Manias”. Continuing his career with junior Mac Mahon who took the business over from his father.. 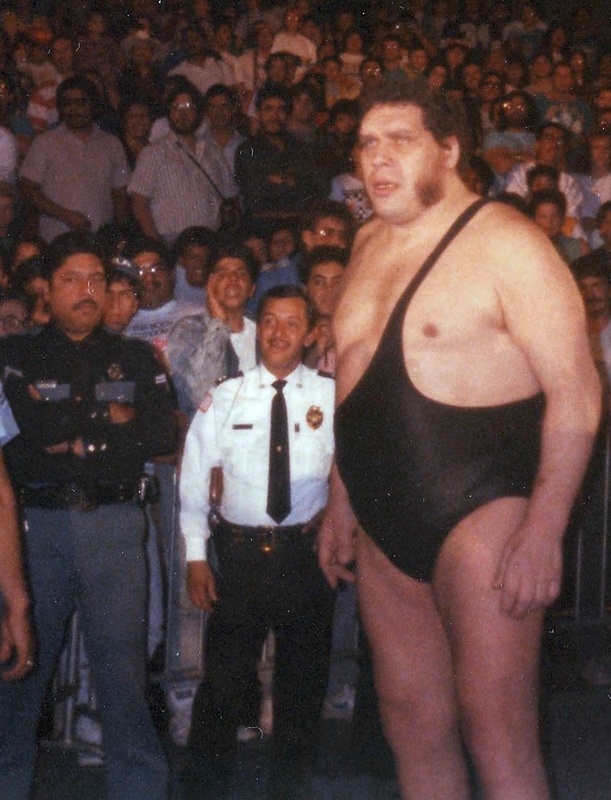 Along with a whole mass of title belts, Andre made use of his acting ability, appearing in various cameos, in Big Foot, The Million Dollar Man, and perhaps his best role as the lovable giant Fezzik in The Princess Bride. Truth is often stranger than fiction, as in the movie, Andre Heart of the Giant, (2007) the movie actor Daniel Gilchrist who played Andre was 7ft 7inches in height. 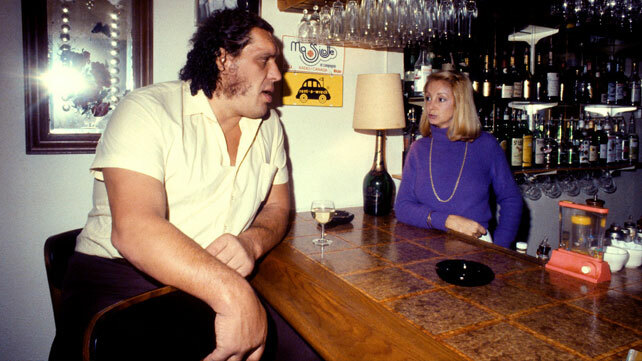 Andre also won some contradictory awards, for example, unofficially, ”The greatest drunk on Earth” In 1988 he was voted both “The most popular” and “The most hated wrestler” of the year. In 89 Wrestling Observer called him “The most Embarrassing”, along with another list of negative views. Pro.Wrestling Illustrated by contrast awarded him “Most Popular Wrestler of the Year” 1982/88/89.at the same time listing him in 88 as the “Most Hated”. It just goes to prove, you can not please some people. One thing is for sure, he won’t be forgotten. Despite medical help, he continued to grow, his habit of drinking enormous amounts of alcohol not helping, one report says he drank 156 beers in one sitting, and he died peacefully in his sleep in Paris France on January 27th 1993 after attending his own fathers funeral. Cremated his ashes were scattered back at his ranch in Ellerbe North Carolina. Having been undefeated for over 15 years in the WWE, a year after his death, Andre was inducted into the newly founded WWW Hall of Fame, ending the career of what most fans still remember as “The Gentle Giant.